Is Compensation for Workplace Injuries Adequate? The issue of the adequacy of compensation for workers who are disabled by their employment generates great controversy. State-regulated workers' compensation programs provide wage replacement (or "wage-loss") benefits to workers while off work due to a workrelated disability, as well as medical treatment and rehabilitation services to assist such workers in returning to work. Since employers apparently pay the costs of workers' compensation programs and workers apparently derive the benefits, the situation is ripe for misunderstanding and hyperbole. Nevertheless, policymakers must make such judgments when they set benefit schedules under workers' compensation statutes. 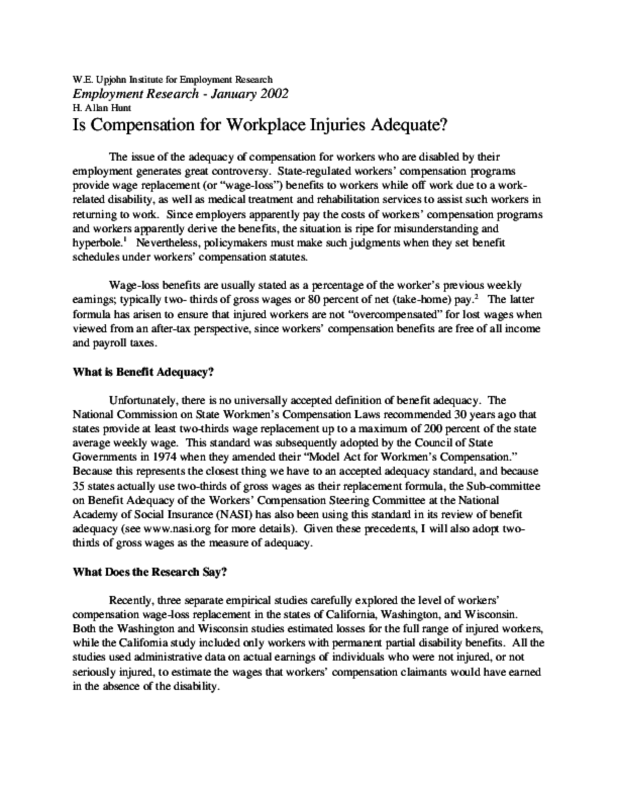 Title: Is Compensation for Workplace Injuries Adequate?